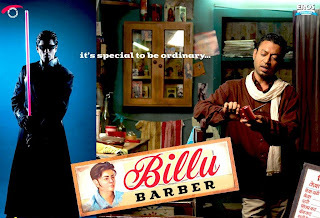 The title of SRK's latest production directed by Priyadarshan 'Billu Barber' has been cahnged to 'Billu' as it was found derogatory by the Salon and Beauty Parlour Association. According to the chairman of the association the term 'Barber' denotes not just an occupation but is also a caste. So after a meeting between the two parties at Mannat Shahrukh agreed to remove 'Barber' from the title. The change will be made to posters wherever possible. SRK has said that as his film's aim is not to hurt anyone he will do anything possible to not offend anybody through his film and after they will watch the film they will realise that there is nothing derogatory against them. 'Billu' will release on 13th February worldwide.